Many of the core facility microscopes (e.g. laser-scanning confocals) run solely from Windows-based software, and save the images generated on those microscopes in a brand-dependant proprietary format. For those of you using Apple Mac or Linux operating systems, Image J is a free, non-commercial, Java-based cross-platform image analysis and display programme in the public domain that you can tune to your own requirements. It was developed by Wayne Rasband at the National Institute for Health, subscribing to the four freedoms underpinning truly free software. A good introduction can be found on Wikipedia with a general history in Nature Methods and a later paper explaining the development of ImageJ2 – the ImageJ ecosystem – in a special issue of Molecular Reproduction & Development on Advances in Biological Imaging. ImageJ2 extends the capability of ImageJ to support the next generation of multidimensional scientific imaging, see this paper for further details, and this flavors link. Image J works from user-written plug-in macros that are contained within the core programme that you install on your computer. You can add downloaded plugins to your copy of Image J to personally customise it and thus tune it to your purposes. The plug-ins are stored with the programme (e.g. 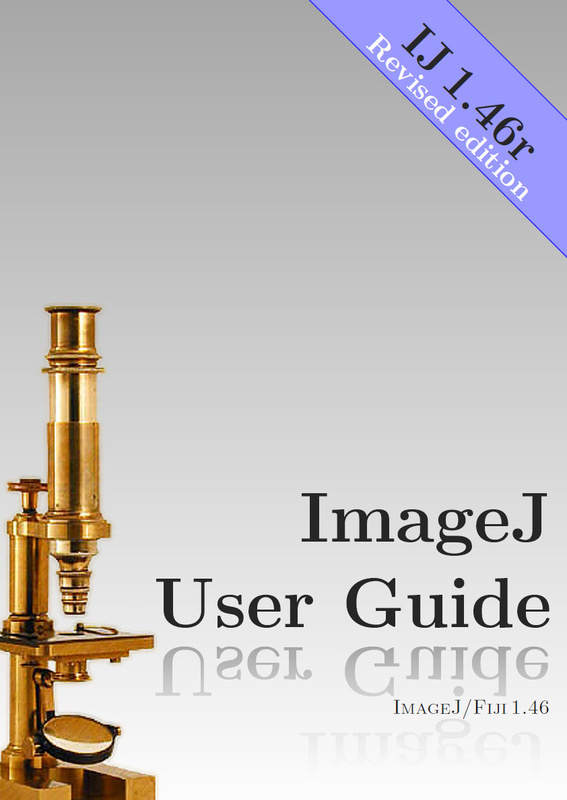 C:\Users\[your name]\ImageJ.app\plugins) in the plugins folder. An example screenshot of the Image J directory is shown on the right, below, in the sidebar. 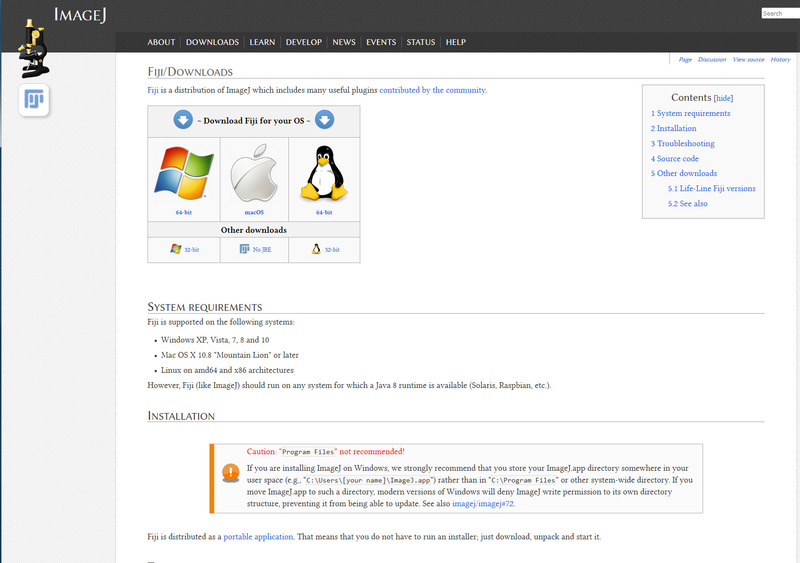 It is recommended that you do not allow installation into the Program Files directory (see installation warning). Fiji is an acronym: Fiji Is Just ImageJ. Read about it on Wikipedia here, and about its development in this paper. It is designed for microscopists, image analysts and bioinformaticians. When publishing work which has used ImageJ or Fiji, see the citation guidelines. You can download Image J either from the original NIH website, or the comprehensive instructions on the Image J website. Please do read the installation warning on that website. The most comprehensive set of several hundred plugins can be found on the Image J website (http://rsb.info.nih.gov/ij/), and are grouped under headings: Acquisition, Analysis, Filters, Graphics, Input/Output, Stacks and Utilities. Other plugins are available from MBF (Tony Collins), Scourceforge, Nico Stuurman, Volume viewer (see also VolumeJ and its manual). A one-stop shop for image acquisition, manipulation and publication. 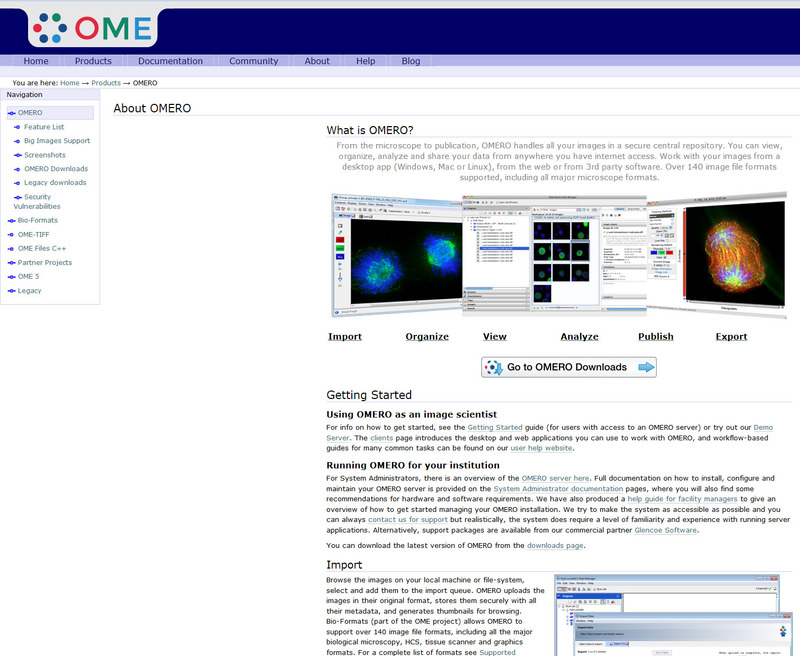 as the website says: ‘From the microscope to publication, OMERO handles all your images in a secure central repository. You can view, organize, analyze and share your data from anywhere you have internet access.’ See the OMERO page here. It is developed as part of the Open Microscopy Environment (OME) which you can read more about here.